Roared on by the crowd, Makwala makes light of the sodden track to finish in 20.20sec! I think he’s fit enough. He’s into the semis, which take place in approximately two hours. The Isaac Makwala saga continued to gather pace almost as though a circus act. The drama continued as the beleaguered IAAF did a 180 degree turnabout to allow the Botswana track star a special dispensation to race, solo! Isaac Makwala, who was barred from running in the 200m heats and the 400m final due to a so-called sickness, was granted permission to run a specially-convened 200m time-trial. We were set for a 7.05 pm start this evening, with the main focus set to be on the women’s 400m final at 9.50pm. Yet, things have been rearranged for the sake of the new twist in the Isaac Makwala tale. He was ruled out of the 200m heats on Monday and last night’s 400m final after the IAAF’s medical team quarantined him due to what they claim to be suspicions he might’ve been suffering from norovirus, a claim both the athlete and Team Botwana rejected, and roundly criticised by a panel of former track stars, including the legendary Michael Johnson. 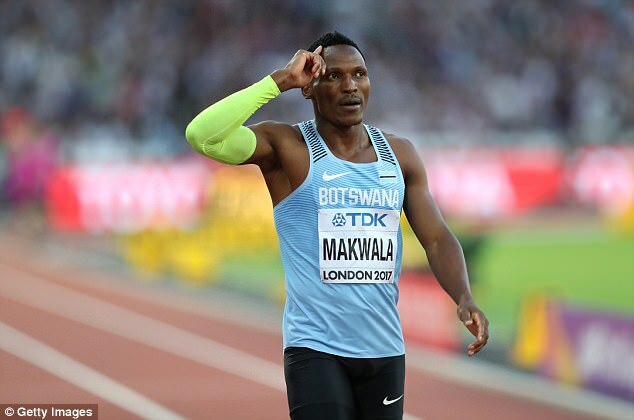 Shamed and reeling from the scandal, the IAAF this afternoon, gave Makwala permission to run a specially-convened 200m time-trial at 6.40pm, clocking in a time of 20.20 sec. Since he ran a time faster than 20.53 sec, he will be allowed into the semi-finals in about two hours. So settle in early, folks! It’s been tipping it down in east London all day, but after spending the past 48 hours burning with indignation Makwala may well end up leaving scorch marks on the track.